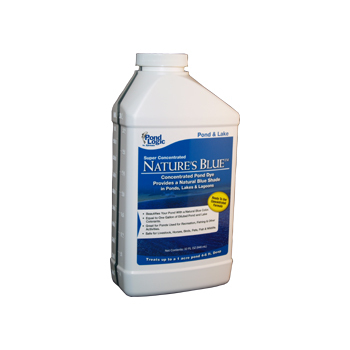 Blue Dye is formulated to give your pond a long lasting natural blue color. One quart of our super concentrate will treat one surface acre of water 4' to 6' deep. with the color dark aqua blue. It is formulated to impart an attractive blue coloring to natural and man-made ponds, water hazards, lakes and fountains. It is comprised of both yellow and blue dyes that reduce sunlight penetration, thereby preventing photosynthesis of algae and cyanobacteria. It is important to never let the blue color fade for this will give weeds and algae a chance to become established making them difficult to control. In colder climates Blue Dye should be added just before winter to stop sunlight from penetrating the ice. Water temperature and degree of agitation will influence dissolution and dispersion of the Blue Dye. Note: Item may differ from photo on right. We sell 3 competing product lines of blue dye. All are the identical product for the same price. Just different packing containers. We will ship you the one we have in stock. From Anonymous of Lebanon, Ohio on 6/9/2012 . From Stephan Jaques of providence, Rhode Island on 6/19/2009 .